It features a simple to use RSVP form, smooth scrolling, lightbox photo gallery, retina ready images, Google Map integration, and much more. This theme is awesome, and Leo is so great with customer service! 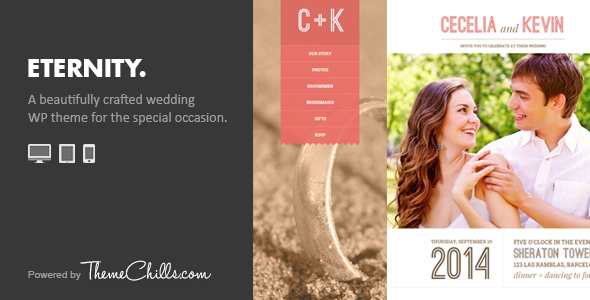 It’s the perfect wedding website theme and extremely easy to use! 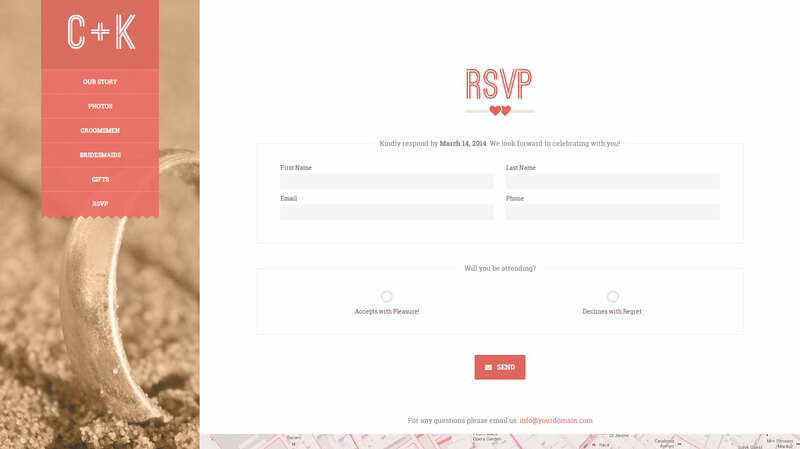 It was new and I wanted something that didn’t look like every other wedding website. It’s very unique and intuitive for the “Average Joe” to navigate. The layout is very eye catching and professional looking. The design is simple and functional. Great documentation included with how to edit from step 1 to finish. After I designed my website (www.thelongestwedding.com) I went to the comments page to get some help with minor bugs (operator error) and received a response within hours which answered my questions. I HIGHLY RECOMMEND THIS THEME and THIS AUTHOR! There’s a lot of reasons why I purchased this theme, but most importantly, Leo was incredible at taking the time and helping me out with the installation and setup. Thank you! Love this theme and Leo was so helpful! I deal with themes all the time and this is exactly what you want in an author! Thanks Leo! The template instructions were very easy to work with. 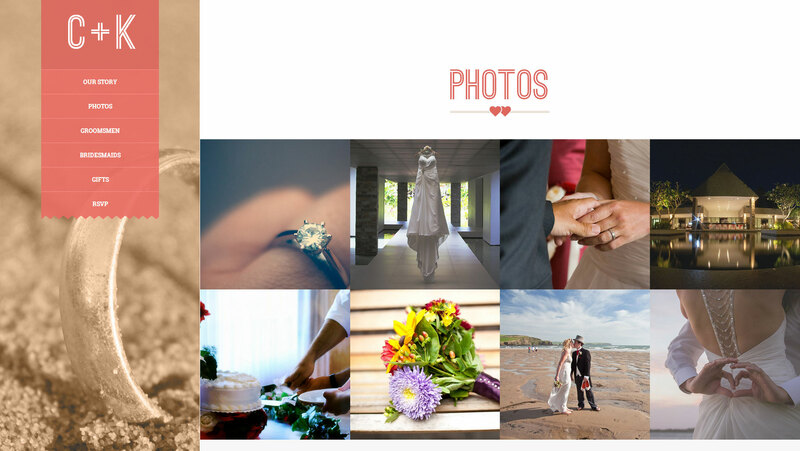 The theme is really flexible and allows for a lot of customization. Even though I’m keeping it mostly the same “out of the box”, it’s nice to have the option. I had to email Leo for a seemingly dumb question on a Sunday night, but he got back to me within minutes and fixed the problem. Leo provided amazing help with every question we had – amazing theme and outstanding support! I’ve bought quite a few things from Themeforest and so far this has been the most complete and best supported theme I’ve bought. Well worth the price! Of all the wedding themes I looked at, Eternity seemed to be the most flexible, robust and clean. Then upon purchasing it, I realized that it was even better than I thought it would be. And if that wasn’t enough, the support is A+++. The developer (Leo) really cares about his theme…and his customers. This theme is amazing. It is easily customized, giving you a finish product that looks professional. 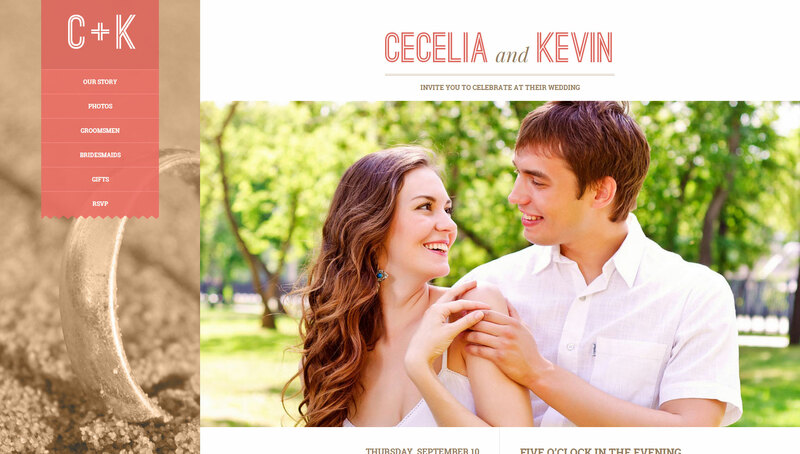 I am so proud of my wedding site and am amazed I was able to put it together as easily as I did. (Barely ever work on wordpress) The author, Leo, is fantastic. He answered all of my questions thoroughly and quickly, which was essential seeing that I have little wordpress skills and I am sending out invitations this week! I would highly recommend this- you won’t be disappointed! I am so excited to show my website off! Everything in this theme is excelent, highly recomendable! Works perfect, support is great, super flexible and easy to setup. Sign up to the newsletter and get updates on the latest themes, tips, tricks and more. I’ll also throw in a free landing page template for your troubles. Just click here to sign up today.